Hello there! Welcome to the second post in my new series, “Recipes That Are So Easy They’re Hardly Even Recipes and Oh Hey Also They All Happen to Contain Avocado.” How’s that for a mouthful? Speaking of mouthfuls! (How do you like my segue? Don’t answer that). Anyway, speaking of mouthfuls! 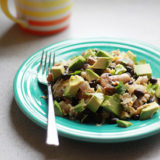 A mouthful of this Black Bean, Mushroom, and Avocado Breakfast Scramble is the way to start a day off right. This is what I’ve decided. Over time, I’ve come to realize that I feel so much better – and stay full way longer – if I start the day off with a healthy, protein-packed breakfast. And that was totally the case last week when I whipped up this delicious – and filling – breakfast scramble. I was still full five hours later! It’s so easy. 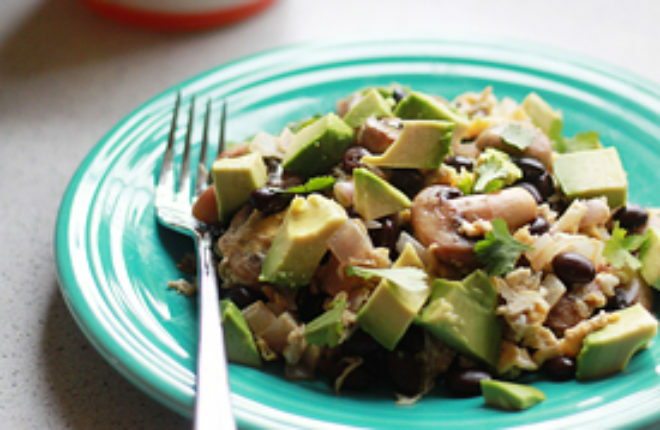 I use a few canned black beans, already-sliced mushrooms, and a couple of eggs. A little onion and a smidge of garlic for flavor. 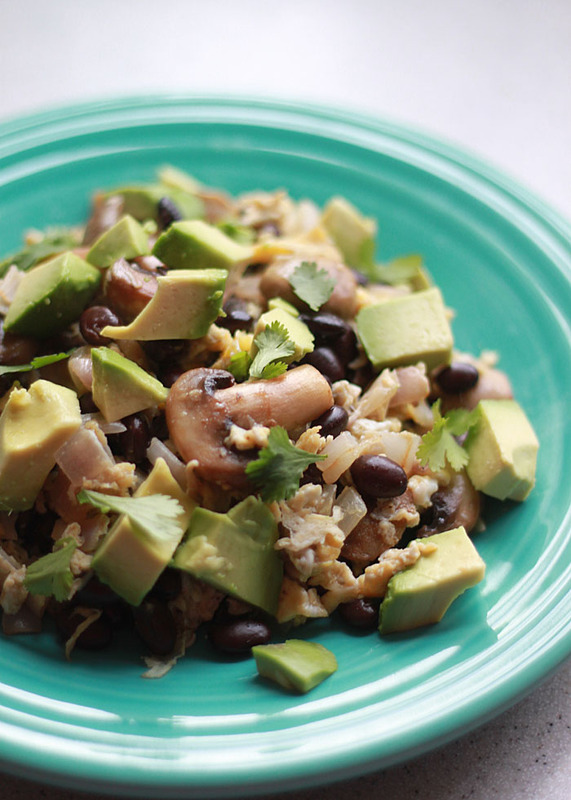 The avocado – and a few pinches of cilantro, if you wish – top off this pile o’ goodness. By the way – no no no, I haven’t gone off the deep end. In case it wasn’t clear, this actually isn’t really a new series. At least, not an intentional one. It’s just that I posted this recipe right on the heels of this avocado toast, and it seems as though I’m developing a bit of a trend. Hey, I said I wanted to keep it simple this year! Honestly, the thing is, I know that personally I find a ton of value in quick, unfussy recipes and ideas far more than I do in upside-down marshmallow s’moretastic frou frou cupcake pies (which, yes, admittedly I also like to dabble in on the rare occasion). But anyway, I’m thinking maybe you might like the easy ideas, too. You know, especially if it has avocados in it . Because hello, avocados. Perfect post-run breakfast! And all my post-run fantasy foods happen to contain avocado so you are right on the money. I’ve been so obsessed with avocados on eggs lately!!! It’s the best combination ever! This mixture would be perfect on the go wrapped up in a tortilla…it actually might be breakfast tomorrow! I just discovered your blog and it is fantastic! I can’t wait to get to my kitchen. Keep up the good work! I was a disbeliever but this was actually very yummy. I’m a personal cook and made a triple batch of this for my client…tasted it…ended up making another batch for myself! I cooked the onions for a lot longer so they would caramelize more. Definitely sprinkle with sea salt to finish. I cooked this in herb butter (just butter w/my garden herbs – basil, rosemary, parsley, etc.). I caramelized the onions and doubled the recipe so I could share it with my husband. (well, okay – I only had 2 eggs, would have doubled those had there been more in the fridge). Did the sea salt thing as per the chef’s recommendation. Thank you so much for a great recipe! A keeper for sure! I substituted chick peas for beans and it worked out great! 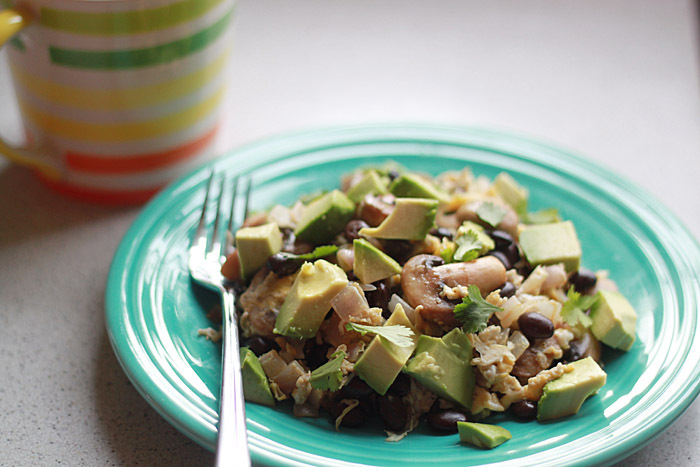 When I made the “BLACK BEAN, MUSHROOM, & AVOCADO BREAKFAST SCRAMBLE” it tastes good, but I must say it did not look like your photos. Once the eggs were added the beans turned the eggs very dark and not very appealing? Hi there, thanks for your comment! Question – did you rinse your beans? 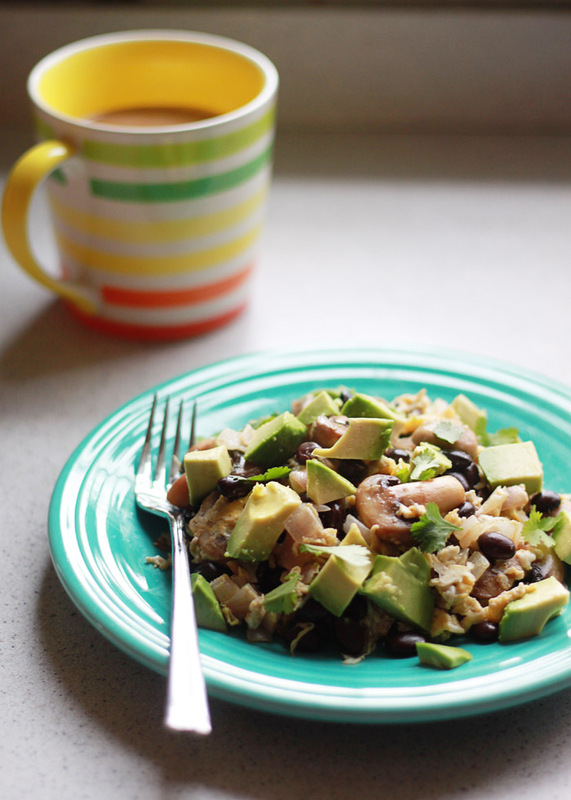 I would like to serve this Avacado dish as a side dish to a breakfast egg bake. Too many eggs??? Is there anything else to substitute? How many times would you multiply for a brunch of 12 – we always have way too much food😉.